Cook and drain fettuccine as directed on package. Rinse with cold water; drain and set aside. Meanwhile, in 12-inch wok or nonstick skillet, heat oil over medium-high heat. Cook chicken in oil 3 to 4 minutes, stirring frequently, until no longer pink in center. Add bell peppers; cook 3 to 4 minutes longer, stirring frequently, until crisp-tender. Reduce heat to low. In small microwavable bowl, microwave peanut butter on High 30 seconds to soften. Stir in soy sauce and water with whisk until smooth. 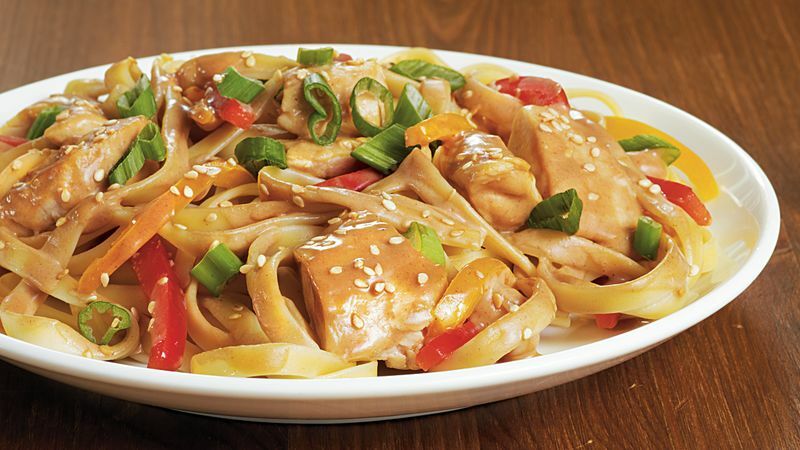 Add cooked fettuccine and peanut sauce to skillet with chicken and bell peppers. Cook and stir until hot. Garnish with onions. Finish off this stir-fry by sprinkling with 1 teaspoon toasted sesame seed. Sesame oil has a nutty flavor and is a key ingredient in Asian cooking. It has a high smoking point, making it well suited for stir-fry cooking. Linguine can be used instead of fettuccine.